mmsonline.com January 2017 MMS 75 FEATURE every part in relation to the ball geometry, pro- grammers ensure consistent quality across all work. When a pallet moves to a new machine, the only extra step is a brief spindle probe touch-off to confirm not part zero, but the machine's own zero position. 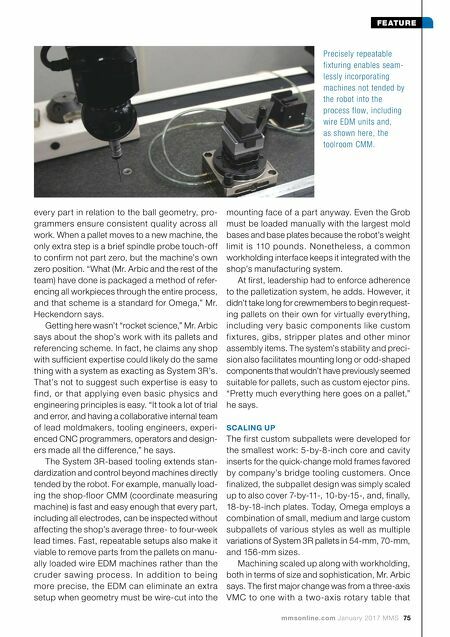 "What (Mr. Arbic and the rest of the team) have done is packaged a method of refer- encing all workpieces through the entire process, and that scheme is a standard for Omega," Mr. Heckendorn says. Getting here wasn't "rocket science," Mr. Arbic says about the shop's work with its pallets and referencing scheme. In fact, he claims any shop with sufficient expertise could likely do the same thing with a system as exacting as System 3R's. That's not to suggest such expertise is easy to find, or that applying even basic physics and engineering principles is easy. "It took a lot of trial and error, and having a collaborative internal team of lead moldmakers, tooling engineers, experi- enced CNC programmers, operators and design- ers made all the difference," he says. 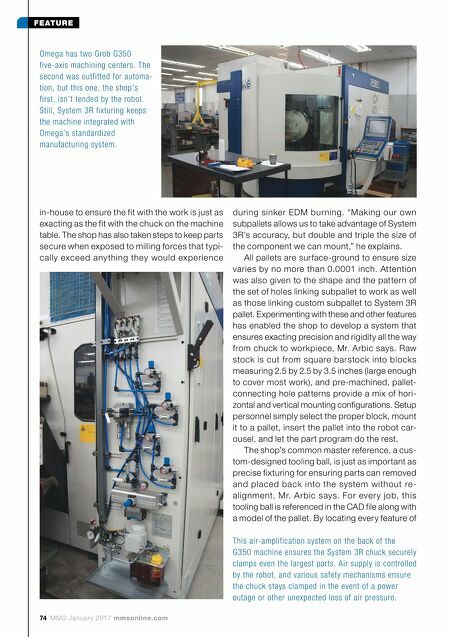 The System 3R-based tooling extends stan- dardization and control beyond machines directly tended by the robot. For example, manually load- ing the shop-floor CMM (coordinate measuring machine) is fast and easy enough that every part, including all electrodes, can be inspected without affecting the shop's average three- to four-week lead times. Fast, repeatable setups also make it viable to remove parts from the pallets on manu- ally loaded wire EDM machines rather than the cruder sawing process. In addition to being more precise, the EDM can eliminate an extra setup when geometry must be wire-cut into the mounting face of a part anyway. Even the Grob must be loaded manually with the largest mold bases and base plates because the robot's weight limit is 110 pounds. Nonetheless, a common workholding interface keeps it integrated with the shop's manufacturing system. At first, leadership had to enforce adherence to the palletization system, he adds. However, it didn't take long for crewmembers to begin request- ing pallets on their own for virtually everything, including ver y basic components like custom fixtures, gibs, stripper plates and other minor assembly items. The system's stability and preci- sion also facilitates mounting long or odd-shaped components that wouldn't have previously seemed suitable for pallets, such as custom ejector pins. "Pretty much everything here goes on a pallet," he says. SCALING UP The first custom subpallets were developed for the smallest work: 5-by-8-inch core and cavity inserts for the quick-change mold frames favored by company's bridge tooling customers. Once finalized, the subpallet design was simply scaled up to also cover 7-by-11-, 10-by-15-, and, finally, 18-by-18-inch plates. Today, Omega employs a combination of small, medium and large custom subpallets of various styles as well as multiple variations of System 3R pallets in 54-mm, 70-mm, and 156-mm sizes. Machining scaled up along with workholding, both in terms of size and sophistication, Mr. Arbic says. The first major change was from a three-axis VMC to one with a two-a xis rotar y table that Precisely repeatable fixturing enables seam- lessly incorporating machines not tended by the robot into the process flow, including wire EDM units and, as shown here, the toolroom CMM.